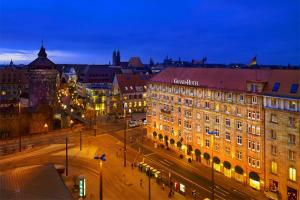 Set in the charming city of Nuremberg, this hotel sits at the entrance of historic Old Town. The hotel features 192 spacious and stylish guest rooms, offering a wealth of amenities to ensure a refreshing stay. Well located to the Imperial Castle of Nuremberg, Tiergarten Zoo, Toy Museum and an array of well-known shopping streets, the hotel serves as the ideal base from which to explore the city. Located in Nuremburg near the Old Town historic area.